Add a classic, stylish touch to your closet or wardrobe space with this White Decorative Drawer from ClosetMaid. The 5 in. H raised-panel laminate drawer features roller glides and fits with the ClosetMaid Selectives 25 in. tower unit. Perfect for jewellery and accessories, the drawer offers smooth, full-extension operation that provides easy access to prized possessions, while the solid drawer bottom offers strength and sturdiness. The Gladiator Premier Modular GearBox offers versatile and accessible storage for a variety of gear. It features a shelf with a cushioned liner, riding on full-extension, ball-bearing slides for smooth and effortless use. You can place this cabinet under a Gladiator Modular Workbench (sold separately) or have it stand alone as an additional work surface or tool stand. Safely house your equipment out of reach with built-in, locking tread-plate doors and a round drawer lock. 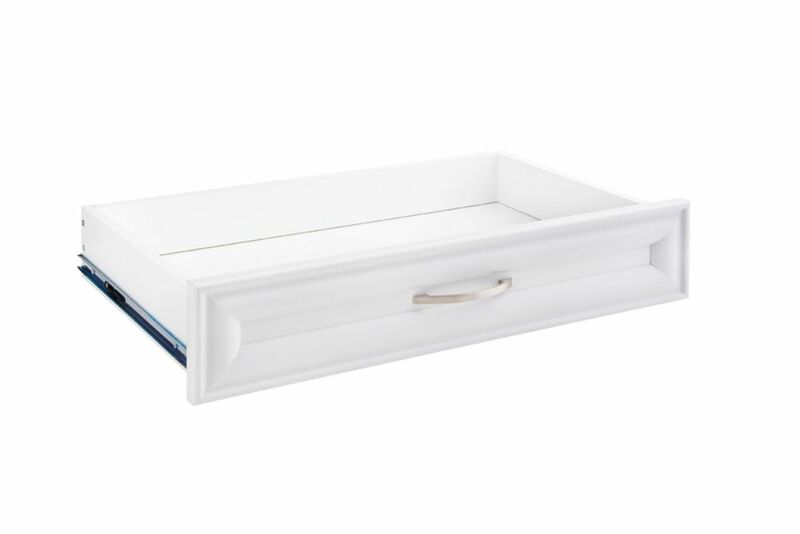 Selectives 23.5-inch x 5-inch Decorative Drawer in White Add a classic, stylish touch to your closet or wardrobe space with this White Decorative Drawer from ClosetMaid. The 5 in. H raised-panel laminate drawer features roller glides and fits with the ClosetMaid Selectives 25 in. tower unit. Perfect for jewellery and accessories, the drawer offers smooth, full-extension operation that provides easy access to prized possessions, while the solid drawer bottom offers strength and sturdiness. Selectives 23.5-inch x 5-inch Decorative Drawer in White is rated 4.4 out of 5 by 34. Rated 5 out of 5 by KennyM from Easy to assemble. Quality product!... Easy to assemble. Quality product! Rated 5 out of 5 by Anonymous from Drawers are easy to assemble and they look absolutely beautiful... Drawers are easy to assemble and they look absolutely beautiful in my new closet! Rated 5 out of 5 by Kyla from Super easy to put in. Slides very well. Only beef... Super easy to put in. Slides very well. Only beef is I wish it was slightly bigger. Otherwise amazing. Rated 4 out of 5 by HomeDepotCustomer from Overpriced but wife likes them. ... Overpriced but wife likes them.